Post of the Day: Posters at Work! Do you go to work everyday and feel that something is missing from your workspace? 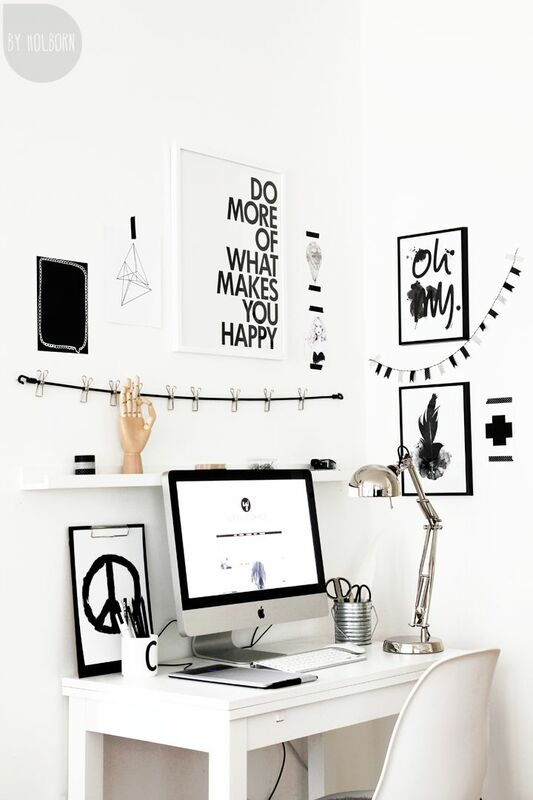 Do you often feel that your workspace could do with a little more pizzazz? We are back with more tips on how to spruce up your workstation with some… YES! You guessed it! Posters! Framed posters, to be exact, as frames enhance the posters without distracting your viewers. Frames also provide decoration without visual clutter and when used properly, they can make your workstation look cosy yet professional. The last thing you need is your boss telling you to grow up or get out! So if you happen to go in to work one day, and frown at the condition of your workspace, then make yourself a promise to arrange for a little renovation! Back in those days, employees were content with having photo frames of their kids, wives, girlfriends or boyfriends, or the whole family in the backyard posing with their pet dog or cat. Others would arrange little knick knacks brought back as souvenirs or given as gifts by others as decorative pieces on their desks. Times have changed and cubicles have evolved over time. Managers sit in big spacious rooms with so much wall space for wall art. Some of us may be in a different line of work that involves managing a store which you’d want to decorate. You want the posters to renew your spirits at work and inspire creativity. The idea of using framed posters as your office decoration is to create a first and lasting impression to your clients and business associates who visit you at work. First impression is important because it is the first thing that people see upon entering your office, and exercise their opinions on you based on the posters in your office. Visualize the placement of the posters that you want to put up. Think of how it will enhance your office space, make it look bigger and brighter, and leave your visitors with raised eyebrows and positive thoughts when they head out the door. 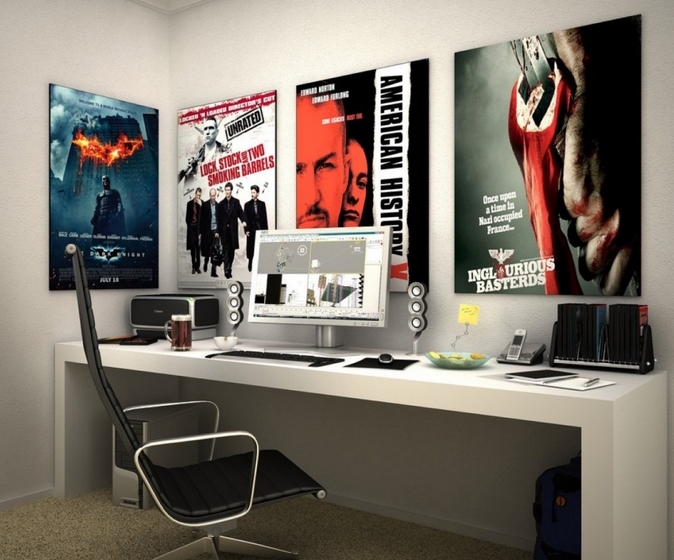 Next, what do you want from using framed posters as your office decor? Do you want it to go with an existing theme in your business? For example, if your core products are music, CDs, and vintage records, then you might want to put up posters that go with your product line. Posters of musicians such as Bob Marley, Pink Floyd, and Nirvana. Go with a theme and it will be easier to know what you want to hang up on those plain white walls. If there is no theme, then go for posters that match your personality or lifestyle. 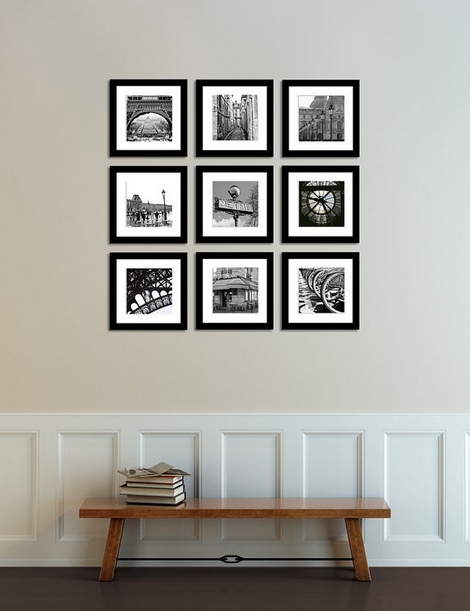 If you love to travel, posters of foreign cities and local tourist hotspots in colour or black and white will do the trick. If you enjoy motivating others with your famous inspirational speeches, posters of Martin Luther King, Mahatma Gandhi, and Nelson Mandela should be on your wall. Tastes differ between each person and how you want to decorate your office is entirely up to you. Now we shall move on to colour coordination. Don’t use posters that are too colourful if you want allow your mind to float freely when brainstorming. Too many colourful posters can blind your visitors as there are too many things to focus on. You want them to look at around with ease and soak up your office environment. Posters with designs that have two to three different colours is good. The image above has a good colour shade combination. 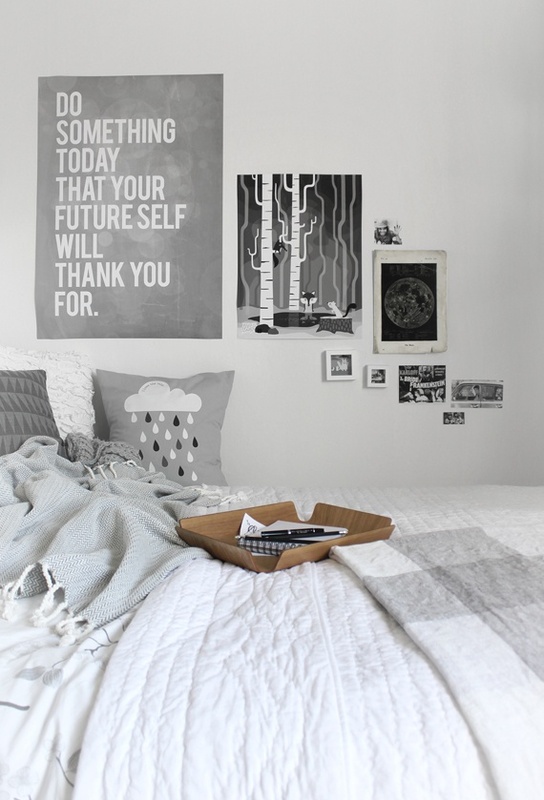 I’d personally go for black and white posters because they have a calming effect on me. Scenic and landscape posters in soothing colours of nature offer a conducive environment of peace and tranquillity. Your colleagues will also find it easier to focus on a task or project at hand. Posterific Tip #3: Size Still Matters! We talked about the different sizes of posters to put up in your home. Now we will apply the same equation to your office. Posters come in various sizes, but there is no size that fits all. Each size is important in creating an overall look in your office. Again, the matching of sizes matters when it comes to how you want your office to look like. Too many small posters may make your office walls look too cluttered and won’t provide conducive space to work in. Too many big posters will leave little space for anything else. A few large posters or a collection of medium-sized posters on one wall will do the trick without making the room feel small. If you want to go for small posters, then three or four small frames on the wall above your side cabinet are enough to spruce up the space and add interest without distracting your colleagues or clients from their tasks. Framed posters as decorative pieces will turn your office into a casual environment and still keep the professional look. We don’t want to over-decorate the place. We want people to be at ease when they work. We want employees to feel like they can gel with the office environment when they come in to work. When clients come in for meetings, they should be comfortable, and are aware that you spent a considerable amount of money and time to turn your office into a workable condition. Posters are a great way to decorate a place, and by doing so, you can follow your heart, mind, and taste, instead of bending over to accommodate a professional artist or interior designer who may prefer his or her own advice to yours! So are we all good to go? Make a list of what you need to do and which posters say most about you. Then it’s time to lay out those posters and get crackin’. Come on over to our Facebook page and have a look at our variety and see which ones are much suited to your taste. I’m sure many of you have bought posters from us. Now you’re probably wondering where to put them! Where to hang them so I can wow my buddies? Where to hang them so my parents won’t think I’m cluttering up space at home? How many should I hang on one wall? Which posters should I put up because everything is awesome! I want a poster showcase, not an overloaded wall art. The best places for poster decor are the living room, bedroom, and movie room (if you have one). Just before you curl up for the night, you can admire the collection of posters on your wall. 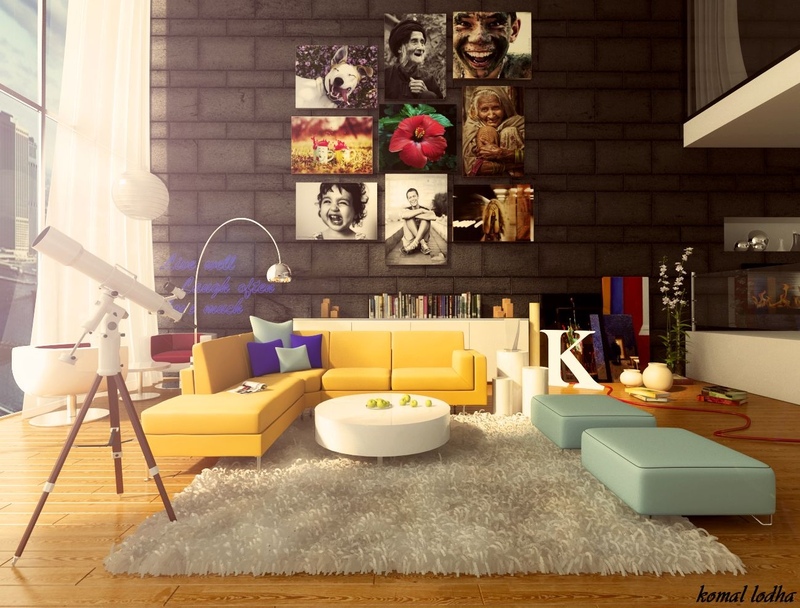 When you have guests over at your place, they can be wowed at the poster collection that you have in the living room. You can organize a movie night, invite some friends over, prepare some snacks and drinks, and voila! Your movie room with its gadgets and vast movie collection will be in all its glory with famous celebrity, sports, and movie posters! This is a place where you doze for the day, rest and relax in the middle, and sleep for the night. It is a place where you can get the ultimate privacy and tranquility. You can do almost anything in your room, before you sleep and after you wake up. So it’s a given that you would want to decorate it as best as you can so it will make the room look good. Unless you have designed your home to be different from others, your living room will be the first place people see when they walk in. The first thing you’ll want to hear from your guests is how beautiful your home is and be wowed by the interior decoration. The best way to elicit such positive responses is to put posters up on the wall, above your wide-screen television or the sofa! If you don’t want to draw people’s attention away from what’s on TV, you can divide the number of posters you want to hang up on either side of the living room, opposite each other. The choice is yours to make. If you have a movie room, you definitely want to put up your favourite movie posters. Or if you have purchased posters on sports and sportsmen, you can add them to your list as well. 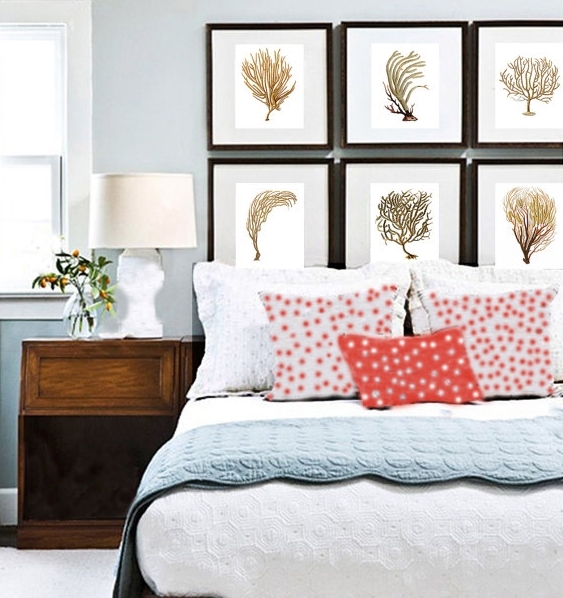 Go with the theme of the room that you want to decorate. If your movie room is a large space, perhaps you can put both sports and movie posters up! One genre on each side of the room. The size of your designated rooms matters between big and spacious or wide and narrow. For example, if you sleep in a big master bedroom, you don’t have to worry much on crammed walls compared to if your room is small and cramped like that in university student residences. Depending on the width and height of the wall, I’ll say 5 to 7 posters of various sizes should suffice. One large portrait-styled poster accompanied by several smaller landscape-styled posters would do the trick. If you’re in a smaller room, then 3 to 5 posters will do. Again, you can have the large sized poster followed by several smaller ones. Or you can have 3 to 5 large posters, side by side. The idea is to balance the posters out. The view would be lopsided if one “side” is too heavy. Now what sort of individual are you? A movie buff? Celebrity stalker? Travel junkie? Sports enthusiast? Decide on a theme. It will make it easier for you to select which posters you want to put up. 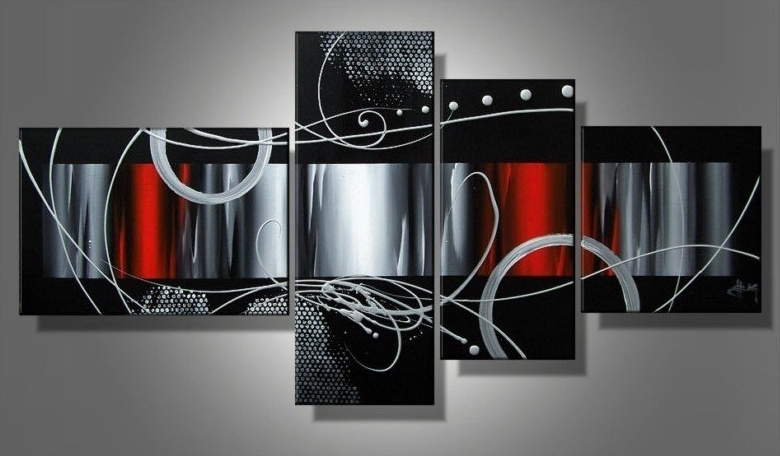 Think of how you want them to look on your wall. Do you like symmetrical patterns? Perhaps you prefer the alignment of your posters to be landscape or portrait. Instead of putting your posters up immediately, you could use several large pieces of paper in various sizes and tape them up temporarily, imagining what your posters would look like on the wall. Once you have made your decision, you can slowly replace each large piece of paper with your selected posters. Make sure you use hooks to hang your posters! So the next time you want a change of scenery, you can swap your current ones for new lots! All set for the big decorating day? We say, lay out those posters and get busy. If you need more posters to add to your collection, feel free to view more at our Facebook page!